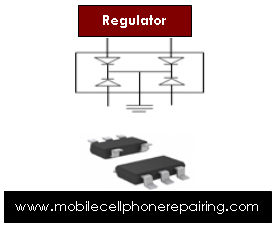 The PCB of a mobile cell phone has several small parts or electronic components. 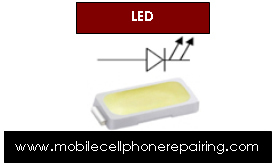 When learning mobile repairing, it is important to learn and understand how to identity these small parts or electronic components and understand their function. Identification of these small parts on the PCB of a mobile phone is easy if you know and understand some of the basic rules. It is also important to understand what to do if any of these small components is faulty. Most of these electronic components are SMD (Surface Mount Devices). They don’t have any leads like thru-hole electronic components. Its size is little bigger than coil. It is found in black colour and looks like a large button. Its function is to increase current. If this coil gets damaged then it has to be changed. It is found in any section of a mobile phone. It is found in many shapes and sizes. Coils are found in 2 colours: (i) Black and white; and (ii) Blue and white. It has binding of copper coil inside. It filters and decreases Current and Voltage. 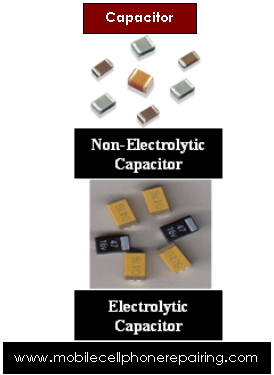 Non-Electrolytic Capacitor: It is found in any section of a mobile phone. Its height is little more than chip resistance. It can be of gray, yellow or brown in color. It has no Positive (+) or Negative (–) side. It filters DC current. 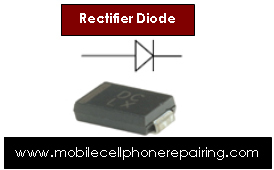 Electrolytic Capacitor: It is found in any section of a mobile phone. Its size is larger than non-electrolytic capacitor. It is found in 2 colors – (i) Orange with brown strip: and (ii) Black with white strip. The side with the strip is Positive (+) and the other side is Negative (–). It filters and stores current. Network Capacitor: It is found in any section of a mobile phone. It is made from 2 or more Non-Electrolytic Capacitors. This electronic component is found in the Network Section of a mobile phone. It is of either black or white color and has 6 pins bent inside. Faults: If the coupler is faulty then there will be no network in the mobile phone. Rectifier Diode: It is found in black color and converts AC Current to DC Current. It passes current in one direction. It does not pass current in reverse direction. LED: LED stands for Light Emitting Diode. It is found in white or light yellow color and emits light. Zener Diode: It is found in charging section. It filters and minimize current and passes forward. It acts as voltage regulator. 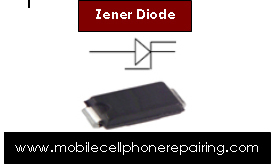 Zener diode has fixed capacity like 4V, 6V, 8V etc. 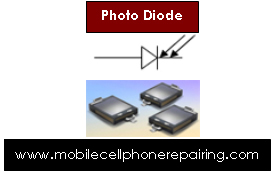 Photo Diode: It is used for Infrared. It captures Infrared Rays. 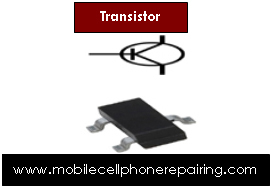 This electronic component is found in any section of a mobile phone. It is of black color and has 5 or 6 legs. It filters current and regulates voltage. Chip Resistance: It can be found in any section of a mobile phone. It is of black color. In some sets it is also found in blue and green colour. It is the smallest electronic components on the PCB of a mobile phone. It Decreases current and passes forward. Network Resistance: It can be found in any section of a mobile phone. It is made from 2 or more Chip Resistance. This electronic component is found in any section of a mobile phone. Transistor is of black color and it has 3 legs. It does the work of switching. Sir how can I send photo of my phone PCB. Sir I have old phone lava iris 405+, during charging jack repairing. He remove some smd component, I don’t what they are. Touch is not working. Can I get image of PCB of touch screen section. To know missing component. Please we need to talk. I want to have a deal with you. I will suggest you to get enrolled in some good Institute and learn practically. It will not take more than 3 Months. Practical is better than theory. Overheating means that there is some kind of SHORTING in the PCB. Replace the Battery Connector and Check. If the problem is not solved by Replacing the Battery Connector then clean the PCB with IPA or Alcohol or Petrol and Apply some Hot Air to the PCB and Check. If the problem is still there then the PCB has to be checked for SHORTING. Get the Board Checked Thoroughly. Looks like some component is faulty. Thanks so much sir for your reply, but how will i identify the faulty component easily? You have to check using Multimeter. There is NO Shortcut. Mainly around the Power IC. Thanks man, am so grateful. Thanks very much for this wonderful work. But please, like the other big part you didn’t let us know the function of fault of these small part of mobile phones. I mean, if they or any of them is faulty, what effect can it have on such phones. Audience, please is there any engr reading this and you stay in Ede, Osun State Nigeria. Please signify, we need to talk. 08064851625 call or whatsapp. Thanks. Sir, I am looking for a book of mobile hardware and software, can you suggest me where wil I get the book and which book is good..
such a good and very helpful information about mobile repairs. thanks sir. Hi Mr.Das,seems to look like you have good knowledge in this field. I have a business order for you in this regard. You can get it in your Local Market where they sell Mobile Phone Parts and Accessories. Sir loved your Site knowelable. What a powerful site I wish you can even add a picture direct from the cellphone when you explain. Really useful website. thanks and pls keep it up. Wt a helpful site it is..!! Plez keep It Up. Thanx a lot. thanks for your information, very useful information.